Working on a new site and garden week 5. I am working on transitioning this blog to a self-hosted domain and making it part of a larger website. The other day I learned how to export this blog here as an xml file and upload it to the new site. But I’m not quite ready to start posting from the new site. I’m chipping away at it in bits and pieces. I’ve had a few obstacles. One of them has been learning how WordPress works when you’re using it to make a website. I will get stuck on one thing that I want to do and then get super frustrated when I can’t figure out how to do it right away. In these situations, when I get over the frustration that makes me want to cry and throw things, I have to laugh at myself. How many times, as a tutor of school-age children, have I lamented that they get frustrated when everything doesn’t come easily to them? I try to explain to them that it takes mistakes to learn, that you have to let yourself be bad at something so you can practice and get good, and that they just need to keep trying. All the while, I’ve gotten caught in the same trap. If something doesn’t come easily right away, I let myself get distracted, procrastinate, and go do something else. My biggest weakness? I don’t like asking for help. 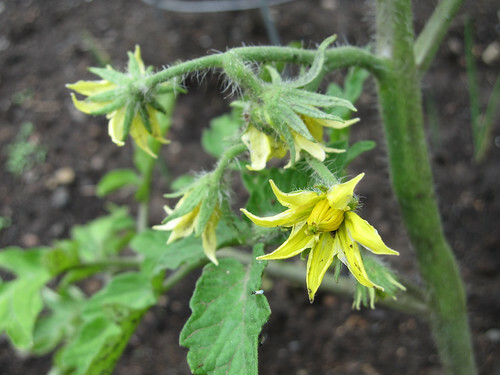 Here are last week’s shots of the garden. It’s gotten even greener by now. 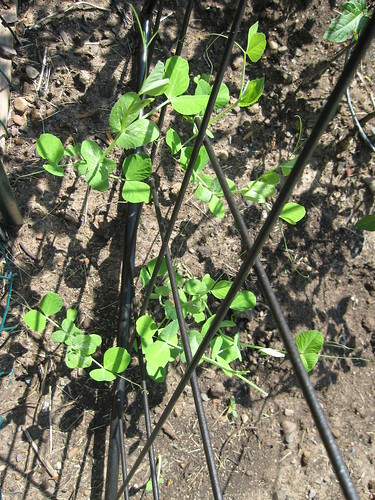 Snap peas have started to climb the trellis. Zucchini plants getting bigger, and the whole garden getting greener. Jalapeños! Sadly, they weren’t spicy. Apparently too much water can do that to them. We had the same problem last year. Another overall garden shot from the other side. 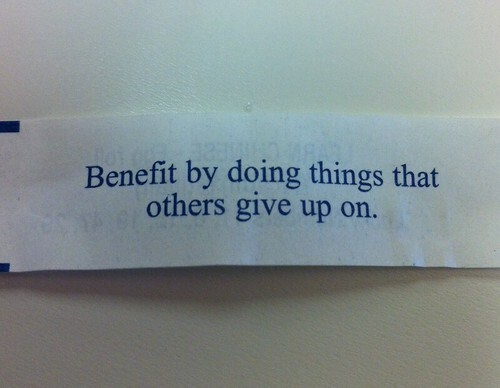 Benefit by doing things that others give up on. 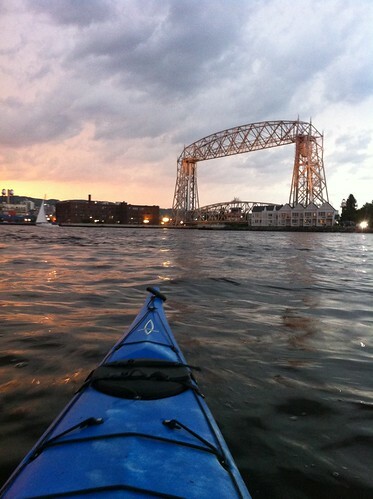 Kayaking: one reason I love Duluth. This is how we watched fireworks on Wednesday. We’ve talked about doing this since we met, because Chris had done it before. We just never got a chance. This year, we finally did it. The fireworks in Duluth are set off from a barge in the bay and it can be quite challenging to find a good spot that isn’t crowded that also has accessible parking. Plus, kayaking + fireworks = gorgeous. We put in from a beach on Park Point before it got dark, and then chilled out in the water, paddling around until it was fireworks time. Seeing the city from the water, the sun setting behind the hill, floating on the water, was just perfect. Now I want to go kayaking every day. Yesterday was the last day of Camp NaNoWriMo for June, and I finished my 50,000 words! Woo hoo! I am far from finished with my revision. In fact, I was forced to rethink my whole story and go back to the beginning and take it in a whole new direction. I’ve only got about 20,000 words of this “new” story, but that’s okay. I took it from three point of view characters down to one. My main character stays in town. I’d created this great city for her to live in, then had her leave it in the first couple chapters of the story. I changed my system of magic back to one that I’ve imagined for a story all along. There are a lot of other changes, of course, but one thing I like is that I know what the ending is going to be. Well, I know the main idea of the ending. And that means I know where I’m going, so the rest of the story will make more sense. I haven’t kept to my blog schedule very well the last couple weeks and I blame it partly on NaNoWriMo and partly on the fact that I started working with a new summer program AND I started tutoring a neighbor. My summer has been busier than I thought it was going to be. Getting used to the new routine, losing the battle against napping on hot summer afternoons, and trying to write 1,667 words of fiction a day have consumed me. Oh, and also, we had a flood. Our city is on a hill, so nobody really took flash flood warnings very seriously. Well, the thing about being on a hill, in a city by a great lake, is that there are a lot of streams, creeks, and rivers going to the lake. And they all swelled up and washed away everything in their path. 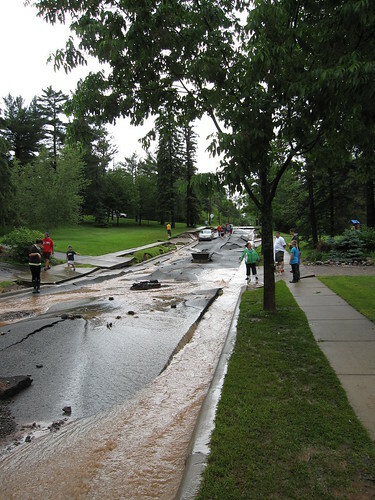 My neighborhood lucked out and didn’t get any damage, but just blocks away our local creek jumped onto the street and washed away all the clay under the pavement and made a street look like an earthquake had hit it. It was a bizarre day. Click here to see my Flickr photo set of pictures and videos I took around my neighborhood that day. Can reading writing advice hurt your writing? In this first revision of my novel, I’m changing a lot of things drastically. That means I’m throwing a lot of good writing out the window, but I’m still keeping and altering some scenes. It’s tough, as a writer, to go back and pick out those parts of the scenes I want to keep, and then to notice that the rest of it, the part I’m leaving out, isn’t really that bad. In fact, it’s pretty good. How did I not notice that when I was first writing it? The thing is, I don’t feel like the writing I’m doing now, to replace it, is as good. Is it because I just can’t see it until later? Or is it because I recently read some books about writing and editing fiction, and I’m letting my inner editor have too much reign at this point in the process? I may be worrying too much about using words other than “said” as dialogue tags and stripping my writing of adverbs. This advice is useful, but not if it makes me self-conscious to the point of making my writing sterile and lifeless. On the other end of things, I get too frustrated with the advice that tells me to “just do it. Just get words on paper,” and focuses a lot on word counts. I WANT to know more about the editing process and what it looks like to sit down and chisel away at what I’ve already written. Apparently, I just need to know where to apply that advice. My conclusion is that writers need to take advice self-consciously. Obviously, anything that causes you anxiety and keeps you from writing is not good. My solution is to take a step back, and give some conscious thought to how I’m following the advice, or whether it would benefit me to follow it. Another solution is to filter the advice and make sure to only apply it to the part of the process I’m in. This can be tricky sometimes, since I’m still exploring my own process and figuring out what works for me. And that’s the thing about advice, too. Writers are all different, and we each need to figure out what works for us. On to another note. I have pictures of Week 2 of my garden. 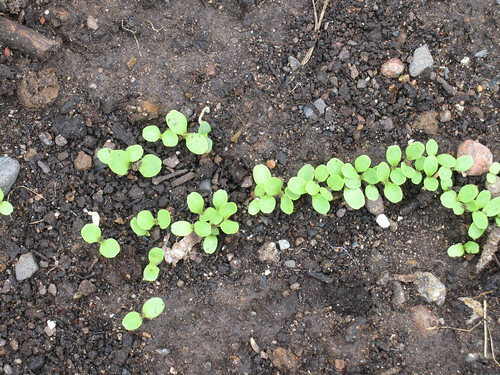 Seeds are sprouting, things are growing! I harvested my first pepper, but the plant came with the almost full-grown pepper on it, so I don’t think that counts. 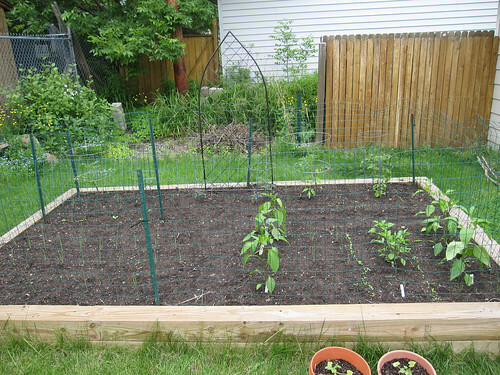 Here’s a pic of the whole garden. I think it’ll be fun to have a week by week collection of these and watch it get greener and greener overall. My zucchini seeds sprouted! I plan to tie them up on the green mesh as they get bigger. I may be a little too late planting them, but we’ll see. Que será, será. 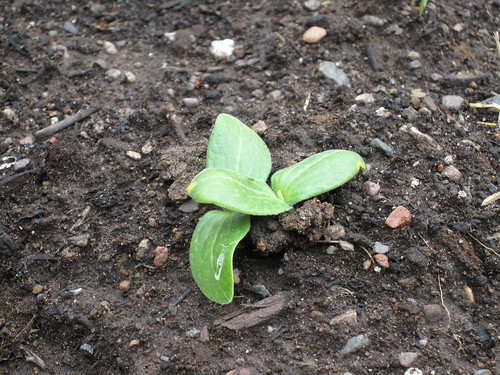 Baby zucchini closeup. I planted two seeds in each hole in case one didn’t sprout. Sadly, I did pull the second sproutling out of each pair. 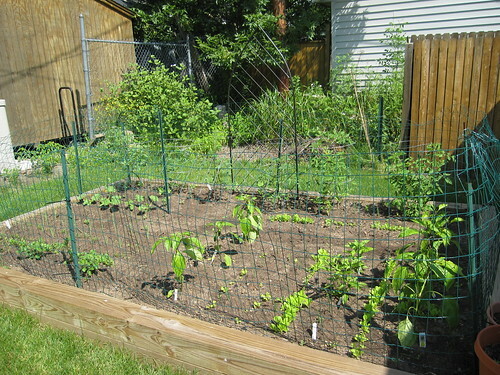 I hate doing it even though I know thinning is a part of gardening. 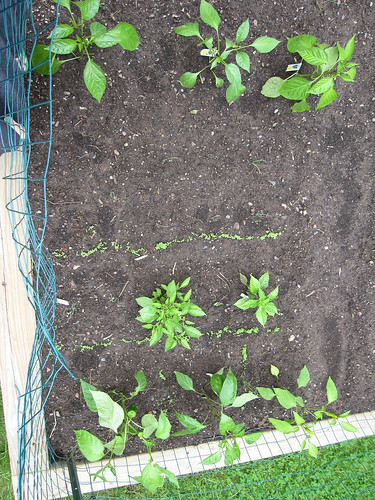 Lettuce sprouts growing in among the peppers! I thinned these, too, after taking pictures. 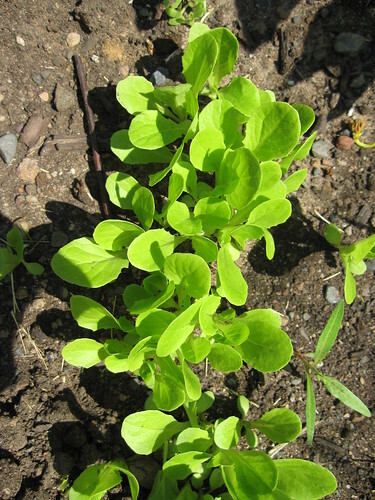 Closeup of cute lettuce sprouts. 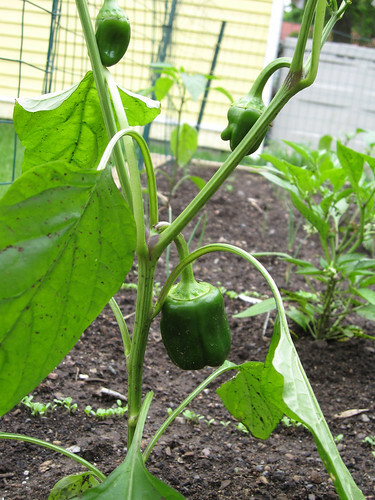 Green bell peppers! The peppers were already on the plant when we bought it. Yay for head starts. I’m excited for this one, because last year I bought one before our garden was built and wasn’t able to plant it for about a month. 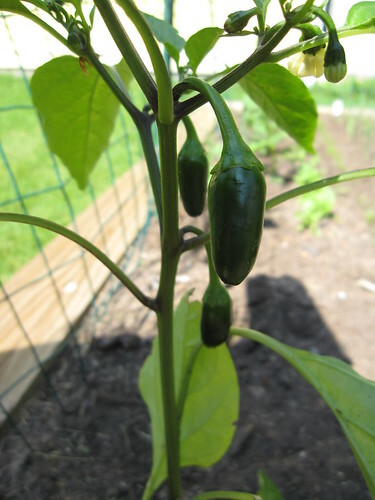 I think we’ll get a lot more peppers this year! 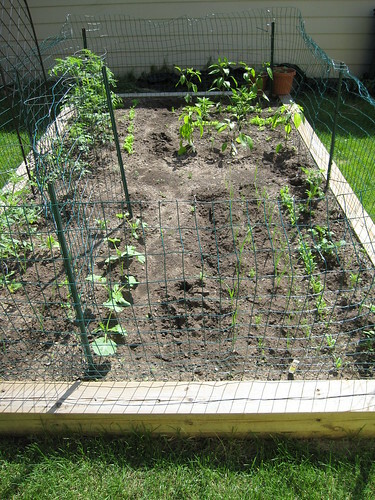 I planted snap peas and pole beans near the trellis and next to the tomato plants so they can climb the tomato cages. Last year, our tomatoes got so huge, I’m not super worried about other plants blocking their sun. 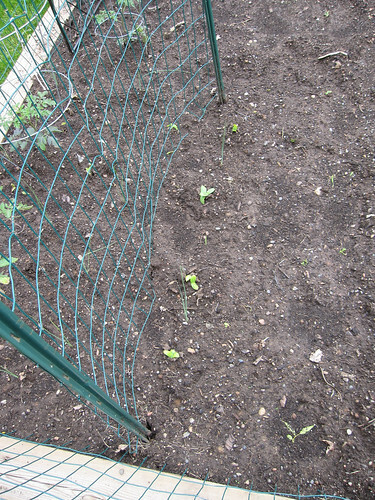 If the beans and peas grow too fast, I’ll just cut them back. 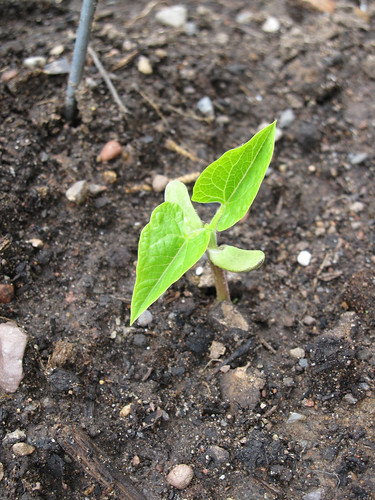 Here’s a pole bean seedling. Cute! 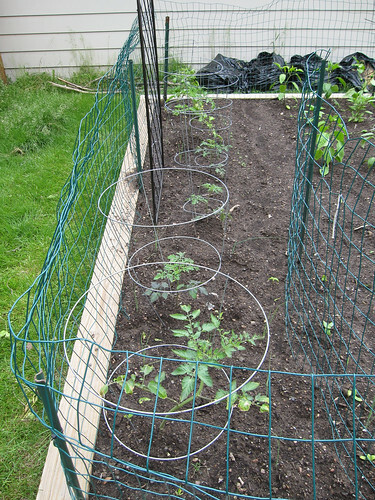 And, a shot of the tomatoes now, to compare with when they get really big!